In my last post (Geocoding for Neatline - Part I), I covered how to programmatically geocode a set of addresses and generate a CSV file for use in Neatline. In this post, I’ll go over how to actually post this information in Omeka and make it available for use in your Neatline exhibit. A running Omeka instance with the Neatline, and NeatlineFeatures plugins installed. In Mechanize you can define a user agent (a web browser), and it’s a good practice to define the user agent as a browser that you don’t use on a daily basis to avoid any caching or username/password issues. For me, I set this to “Mac Safari” (you can use this on Windows too), but you can choose from any of the user agent aliases Mechanize provides. If you ran this code right now, it wouldn’t actually do anything visually, but this bit of code finds the form on the admin page that contains the login information, then sets the username and password on the form, and submits it, effectively authorizing you to do other things with Omeka in the context of the program. This code tells Mechanize to click on the link with the text of Items with a regular expression. In this case, the regular expression isn’t necessary, but is useful when you need to do a partial match on a link (or some other component) that is on a page, and something I do by default. After running this script, when you log on to Omeka, you should see newly created items with their locations populated and a pretty map that you can use in Neatline. Note: these items were not set to be ‘public’, but you can easily add this to the script, and can be your homework. Assuming you’ve read the documentation on creating Neatline exhibits, you can now simply add these items and have them placed spatially by clicking on the Map icon in the Neatline editor. This set of posts shows you how to automate geocoding of your data and integrating it with a Neatline exhibit. These automated methods can save you a lot of time doing data entry, but you should keep in mind that a really great Neatline exhibit really requires you getting in to the exhibit and using your imagination to tell an interactive story. How your users interact with your exhibit depends not only on the quality of your data, but the time you spend working on the interactions. Cite this post: Wayne Graham. 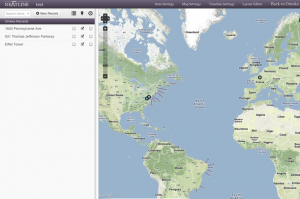 “Geocoding for Neatline - Part II”. Published September 11, 2012. https://scholarslab.lib.virginia.edu/blog/geocoding-for-neatline-part-ii/. Accessed on .